Let Annie Foley Catering on Martha’s Vineyard create that special day you dreamed about. Big occasions to intimate parties. Classic New England dinners to worldly cuisine. We cater to you, creating the perfect time for you and your guests. 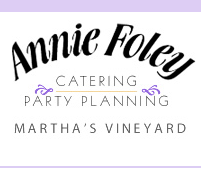 Based on Martha”s Vineyard for over 20 years, Annie Foley Catering has a great crew, vendors and suppliers. We use the freshest and finest produce, seafood and meats. We also try to use locally produced products where ever possible. From Small to Large Weddings and Cocktail Parties, Fundraisers, Clambakes, Dinner Parties, Family and Corporate Gatherings, Annie Foley Catering covers all types of events. We also understand Vegetarian, Vegan, and Gluten-Free requests- please enquire your menu’s tailored to your individual taste.